Citation: Sridhar P, Arole V, Bharambe V et al. A study of anatomy of calot’s triangle and its clinical significance. Pulsus J Surg Res. 2018;2(2):45-49. Standard texts of anatomy offer much knowledge on Calot’s discovery of an anatomical space in the right sub hepatic area, named in his honor as “The Calot’s Triangle” . Lying deep to the inferior border of liver, it is bounded medially by the Common Hepatic Duct (CHD), laterally by the cystic duct and inferiorly by the lower border of the liver. This small space has many important structures present in it such as the Cystic Artery (CA), the cystic lymph nodes, lymphatics from the gallbladder, cystic veins, autonomic nerves to the gallbladder and lose adipose tissue . Dangerous yet common afflictions of the gallbladder include acute inflammations, ascending cholangitis and gallstone pancreatitis. Treatment of these conditions may need surgical intervention in the region of Calot’s triangle. Bile duct injury is a known risk of these surgeries, such as cholecystectomy and even an experienced surgeon is likely to at times cause some damage despite the utmost care taken during the surgeries [3,4]. It was reported by Ahmad et al that 9% of all patients who were taken for laparoscopic cholecystectomy, were converted to standard open cholecystectomy and the main cause for this was found to be the variant anatomy of this region . Thus it is crucial to be well aware of the variations which can exist within the Calot’s triangle so as to minimize all possible intra and postoperative risks . The present study was undertaken to observe the boundaries and contents of the Calot’s triangle through the meticulous dissection of 20 formalinfixed cadavers to observe the anatomy of the Calot’s triangle and note any variations. The knowledge acquired through this study may help surgeons in laparoscopic and open surgery in this region. Institute’s ethical committee clearance was obtained for the study. The study was carried out on cadavers received by the process of body donation which were donated to the Hospital for purpose of anatomical dissection and research. Hence no separate consent was needed to be taken for the present study. Twenty formalin-fixed cadavers were dissected meticulously. The stomach was removed taking care not to damage the coeliac trunk. The inferior border of the liver was cut to expose the Calot’s triangle region for the ease of dissection and visualization. The common bile duct, its right, and left divisions and the cystic duct were dissected meticulously. The coeliac trunk was identified as it emerges from the abdominal aorta and its branches were traced until the origin of the cystic artery. After dissection of the boundaries of the Calot’s triangle, the contents were dissected and visualized. Any variations therein were noted and photographed. All the variations observed in the present study were compared with the variations reported by earlier researchers. In 95% (19/20) cadavers, the lateral boundary of the Calot’s triangle was formed by the cystic duct, the medial boundary was formed by the CHD and the superior border by the lower border of the liver. 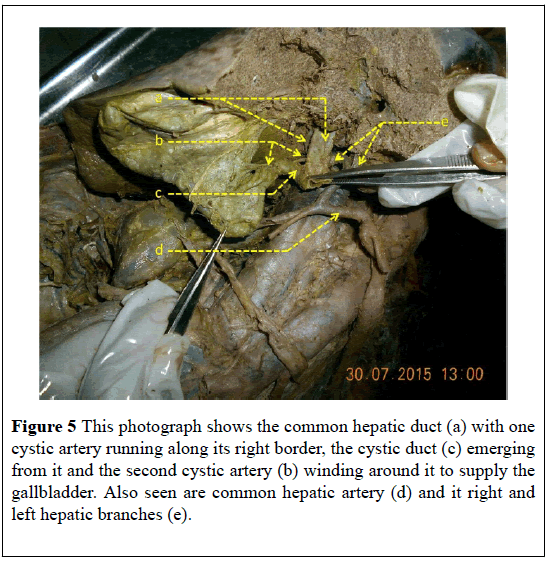 In 5% (1/20 cadavers) the Right Hepatic Duct (RHD) and the Left Hepatic Duct (LHD) were seen parallel to each other and were forming a medial boundary (Figure 1). 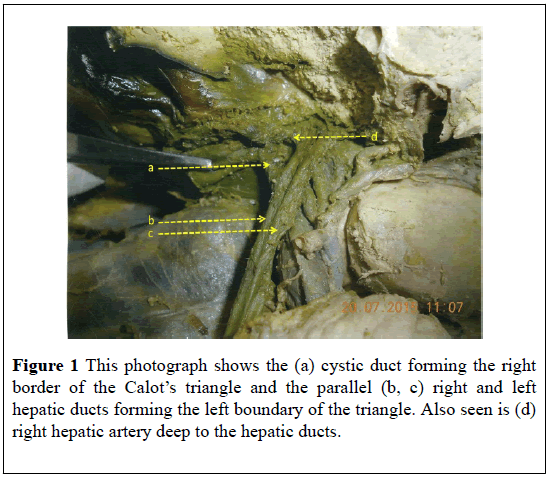 Figure 1: This photograph shows the (a) cystic duct forming the right border of the Calot’s triangle and the parallel (b, c) right and left hepatic ducts forming the left boundary of the triangle. Also seen is (d) right hepatic artery deep to the hepatic ducts. In 40% (8/20) of the cadavers, CA along with a part of the right hepatic artery (RHA) or its branches and some additional structures were contents of the triangle. The position of the RHA and CA within the Calot’s triangle was found to vary. In one case the CA was seen in the centre and a part of the RHA in the upper part of the triangle. In the second case, the CA was seen in the upper part while a branch of the RHA was observed in the centre of the triangle. In another two cases, both a part of the RHA and the CA were seen in the upper part while in one case a part of the RHA and bifurcating branches of the CA were seen in the centre of the triangle. In another one of these cases, five arteries were observed in the triangle. They were RHA, its hepatic branch, cystic artery and its two bifurcating branches (Figure 2). Figure 2: The photograph shows five arteries as contents of Calot’s triangle namely right hepatic artery (a), its hepatic branch (b), 2 branches of the cystic artery (c, d) and the cystic artery itself (e). In one case the RHA was seen in the upper part of the triangle and an accessory hepatic duct was also observed as a content of the Calot’s triangle. This accessory duct joined the CD with the CHD. In this body, the CA passed posterior to the CHD, anterior to the accessory hepatic duct and then curved along the CD to enter the gallbladder (Figures 3 and 4). In another one of the cadavers along with the CA, the portal vein was a content of the triangle. Here the CA was seen going posterior to the portal vein and it then entered the gallbladder through the posterior surface of its body. 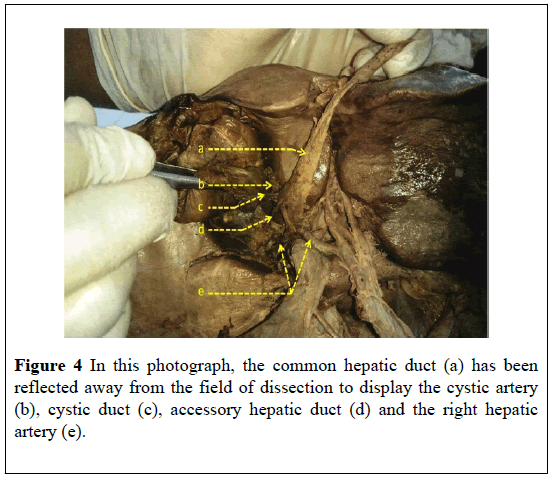 Figure 3: The photograph shows the common hepatic duct (a) being joined to the cystic duct (d) by the accessory hepatic duct (b). The cystic artery (c) can be seen passing anterior to the accessory hepatic duct. Also seen are right (f) and left (e) hepatic arteries. 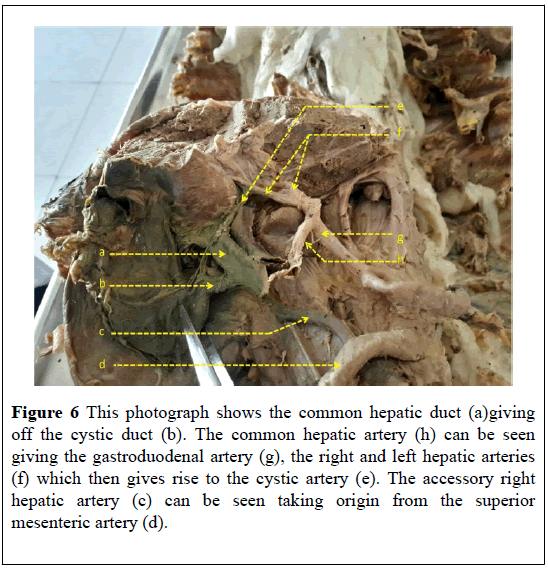 Figure 4: In this photograph, the common hepatic duct (a) has been reflected away from the field of dissection to display the cystic artery (b), cystic duct (c), accessory hepatic duct (d) and the right hepatic artery (e). In four of the cadavers, the CA passed posterior to the CHD to enter the triangle while in another four the origin of the CA was seen inside the triangle with the RHA passing posterior to the CHD. In 25% (5/20) cadavers, only the CA was a content of the Calot’s triangle. In four of these bodies, the CA was seen passing posterior to the CHD and then through the centre of the triangle to supply the gallbladder. In the fifth cadaver, a case of double CA was observed, both of which came from the RHA and passed posterior to the CHD. One CA was seen going upwards in the triangle along the right border of CHD and then along the upper border of the triangle to enter the gallbladder. The other CA was seen to loop the CD from posterior to anterior before entering the gallbladder (Figure 5). Figure 5: This photograph shows the common hepatic duct (a) with one cystic artery running along its right border, the cystic duct (c) emerging from it and the second cystic artery (b) winding around it to supply the gallbladder. Also seen are common hepatic artery (d) and it right and left hepatic branches (e). In 10% (2/20) of the cadavers, only RHA or its branches was a content of the triangle. In the first body a branch of the RHA was alone seen in the centre of the triangle as in this body the CA traveled anterior to the CHD and the triangle to enter the gallbladder. In the second body, two hepatic branches of an accessory RHA from the superior mesenteric artery were seen in the triangle. In this body, the main CA arising from the RHA traveled anterior to the CHD and the triangle to enter the gallbladder while an accessory CA from the accessory RHA was seen entering the gallbladder along the posterior surface of the CD (Figure 6). Figure 6: This photograph shows the common hepatic duct (a)giving off the cystic duct (b). The common hepatic artery (h) can be seen giving the gastroduodenal artery (g), the right and left hepatic arteries (f) which then gives rise to the cystic artery (e). The accessory right hepatic artery (c) can be seen taking origin from the superior mesenteric artery (d). In 5% (1/20) cadavers the RHA along with portal vein was a content of the triangle. The RHA was seen in the upper part of the triangle while the portal vein appeared to be the main content. Here the CA was absent and it was assumed that the gallbladder was probably supplied from the hepatic bed. In 5% (1/20) cadavers, the portal vein alone was a content of the triangle. The CA was seen traveling anterior to the CHD and the triangle to enter the gallbladder (Figure 7). 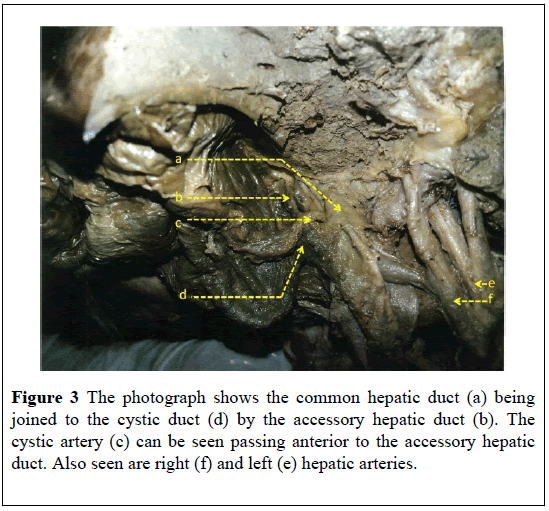 Figure 7: The photograph shows the common hepatic artery (c), the cystic duct (b) and the portal vein (a). Here the portal vein can be seen as a content of the Calot’s triangle. In 15% (3/20) cadavers the liver substance alone was a content of the triangle. In two of these bodies, the CA was seen passing anterior to the CHD and the triangle while in the third body it was passing inferior to the triangle and then crossing the CD at its beginning to enter the gallbladder. In an comprehensive review on the anatomy relevant to cholecystectomy, Nagral stated that not only is it common to misinterpret the normal anatomy of the CA, it is equally common to come across anatomical variations in its origin and course that can predispose to an increased incidence of arterial and biliary injuries during a cholecystectomy procedure . He mentioned that the RHA usually courses behind the CBD to enter the triangle and then gives off the CA within the triangle. Sometimes, however, the RHA can come close to the GB or the CD in the form of a Moynihan or a caterpillar hump. This is associated with the risk of encountering a short CA or sometimes the RHA can even be mistaken for the CA and this can create complications during ligation resulting in hemorrhage. No such course of the RHA was observed in the present study. Nagral stated that the CA usually traverses through the center of the triangle and enters the gallbladder at its neck or body. Close to the GB it usually branches out into an anterior/superficial branch and a posterior/ deep branch. If this branching were to occur more proximally, then both the branches must be correctly identified and ligated separately, otherwise, it can result in bleeding during cholecystectomy. He also mentioned that the CA may give off branches to the CD during its course through the triangle. These must be divided appropriately to visualize the complete length of the CD . In the present study in one cadaver, the CA traversed very high in the triangle along its upper border. In such a situation, it could be mistaken for the RHA. You-Ming Ding et al mentioned that the anatomy of the structures in relation to the Calot’s triangle differ in open and laparoscopic cholecystectomy . This is important to bear in mind because it can lead to inadvertent damage to the cystic artery, the extrahepatic bile ducts or even other intra-abdominal structures which will result in conversion from laparoscopic to open cholecystectomy . To help minimize potential damage to biliary and vascular structures during a laparoscopic cholecystectomy, You-Ming Ding et al classified the laparoscopic anatomy of the CA into three groups. In the first group described, the CA traveled through the triangle and divided into superficial and deep branches. Each branch had its own course with respect to the GB and eventually the branches anastomosed with each other. You-Ming Ding stated that when viewed during open cholecystectomy, this type of CA was lateral to the CD within the triangle. But in the laparoscopic view, it was deep to the CD . This classic CA of group one was observed in 85% of the cases in the present study. In 5% of the cases, the CA fit into category three i.e. the category of compound cystic artery type. Here 2 types of CA were seen, one originating from RHA and the other from the accessory right hepatic artery which was seen to take origin from the superior mesenteric artery. 1.5% of the cases studied by You Ming Ding et al belonged to this category. In 5% of cases in the present study, the CA took origin from liver parenchyma and thus was belonging to group two of the classification. You-Ming Ding et al observed CA which took origin from the gastroduodenal artery in 7.5%patients . This artery was referred to as a “low-lying cystic artery”. They stated that viewed during open cholecystectomy such an artery appears to lie inferior to the CD, but a laparoscopic view will show the same CA as superficial and anterior to the CD. This type of CA variation can get injured during dissection of the peritoneal folds that attach the hepatoduodenal ligament to the Hartmann’s pouch or to the CD. While in their study such a CA originated from the gastroduodenal artery, in the present study it originated from the LHA in 5% (1/20) cadavers. The cystic artery originated from the LHA and passed inferior to the Calot’s triangle and then crossed the cystic duct at its beginning to enter the gallbladder. In the present study, the cystic artery was considered to be a content of the triangle only when either its origin was within the triangle or it was seen passing posterior to the CHD. With this view, it was found that the CA as a content of the triangle in 65% (13/20) of the cadavers. In 3 cases the origin of CA was within the triangle and in 10 the CA passed posterior to the CHD. Out of the remaining 7 cadavers, 5 showed the CA passing anterior to the CHD, 1 was inferior to the triangle and in the last cadaver the CA was absent. Ahmed and Sylvia conducted a study on 60 cadavers and reported that in 11 cadavers the CA originated inside the triangle and in 47 cadavers the origin was outside the triangle . In the cases where the CA originated outside the triangle, it passed posterior to the CHD in 38 cadavers while in 9 cadavers it passed anterior to the CHD. However, unlike in the present study, they have reported that the CA was a content of the triangle in all 60 cadavers irrespective of whether it passed anterior or posterior to the CHD. In a study by Andall et al., it was reported that cystic artery typically originated from the right hepatic artery in 79.02% of the cases studied and was found in the hepatobiliary triangle in 81.5% cases. The study reported cystic artery passing anterior to the CHD in 17.9% and anterior to the common bile duct in 5.4% cases. In 8.9% of the cases studied multiple cystic arteries were observed . In 5% (1/20) of the cadavers in the present study, it was found that the CA entering the gallbladder at the posterior surface of its body. Here the RHA originated from the celiac trunk, traveled posterior to the CHD to enter the triangle and once inside the triangle it divided into upper and lower branches. The lower branch proceeded to enter the liver and the upper branch continued as the CA. The CA went posterior to the portal vein and then entered the gallbladder along the posterior surface of its body. Youming ding et al have described in their study, a similar finding which they refer to as ‘cystic artery originating from a variant right hepatic artery’ . They found that in 18% of their subjects, the right hepatic artery passed deep to the neck of the gallbladder and then extended between the gallbladder and the liver parenchyma towards its right side. Giving multiple arteries to the gallbladder bed, it entered the liver parenchyma along the right lateral side of the fundus of the gallbladder. The authors mention that this variant RHA is often completely covered by the gallbladder and a laparoscopic view can give the appearance of a single large artery . In 5% (1/20) of the cadavers in the present study, it was reported that it was assumed the CA was probably supplying the GB through the hepatic bed as no CA was seen in the triangle. In this cadaver, the portal vein was the main content of the triangle and the RHA was seen in the upper part of the triangle. The present study reported that in 25% (5/20) of the cadavers, the CA traveled anterior to the CHD to supply the GB. Chamberlain, Aristotle, Abeysuriya et al. as well as U Dandekar and K Dandekar have reported similar findings with incidences of 10%, 5% and 26.8% respectively [11-14]. Nagral mentioned that usually CA’s which originate from sources other than the RHA, tend to pass anteriorly to ductal structures and are thus more prone to injury . In present study, however, out of the 5 cadavers in which the CA passed anterior to the CHD, in four of the cases the CA originated from the RHA and in one cadaver the CA was found originating from the CHA. U Dandekar and K Dandekar stated that when the CA originates outside the triangle it tends to pass anterior to the CHD or CBD . In the present study too all the 5 cadavers where the CA passed anterior to the CHD, origin of the CA was outside the triangle. When the superficial and deep branches of the CA have separate origins they have been termed as “double cystic arteries”. In such cases, the deep branch has traditionally been described as originating from the RHA and the superficial branch as arising from the RHA as well as from other sources . The present study reported that in 5% (1/20) of the cadavers double cystic arteries were contents of the Calot’s triangle. Here both the CA’s arose from different parts of the same RHA; while one coursed along the right border of the CHD and then along the upper border of the triangle to enter the gallbladder, the other was found to loop the CD from its posterior to its anterior surface and then enter the gallbladder. Such a finding of double CA has been reported with an incidence of 28% by U Dandekar and K Dandekar, 25% by Michels and 12.2% by You-Ming Ding et al. [8,14,15]. The authors mention that the presence of double CA usually means that the deep branch of the CA is absent or replaced and when this branch cannot be identified, it is safe to assume that double CAs may be present. It is also possible that in a case of double CA, the ‘other’ CA may divide into anterior and posterior branches at its origin from the RHA. The frequent problem encountered in all such cases is that when the deep branch of the CA is not found, the other CA is detected only when it starts to bleed [8,14]. The finding of the CA looping the CD has previously been described by Suzuki et al and has been named by these authors as the “Cystic artery syndrome” . It has been said that such a condition can lead to bile stone formation due to the bile stasis resulting from partial or complete obstruction to the CD. The present study also reported some rare findings hitherto unreported. One such finding is that of five arteries being contents of the Calot’s triangle i.e. the RHA, its hepatic branch, CA and it's two bifurcating branches. The presence of five arteries within the triangle can create a confusing picture wherein if a wrong ligature is made, not only can it lead to bleeding that may be difficult to control, sometimes it might be difficult to even identify the bleeder in such a setting. 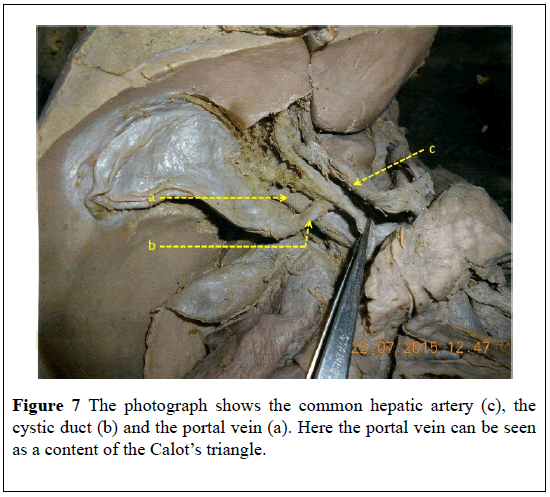 The portal vein was observed as a content of the Calot’s triangle in 15% (3/20) of the cadavers. In one of the bodies, the portal vein and CA were contents, in the second body the portal vein and the RHA were contents and in the last body the portal vein alone was a content of the triangle. The portal vein formed by the confluence of the superior mesenteric vein and the splenic vein behind the neck and body of the pancreas is usually found deep to the common bile duct and the CHA . Such a position of the portal vein means that it is not usually visible in the Calot’s triangle and to visualize the portal vein the common bile duct needs to be pulled upwards. However, it is possible in some cases, as found in this study, for the portal vein to be placed anteriorly and within the Calot’s triangle. The surgical importance of such a finding lies in the ligation of the cystic duct during a laparoscopic cholecystectomy. Use of energy sources for ligation can lead to inadvertent damage to the anteriorly placed portal vein causing uncontrollable bleeding that will necessitate conversion to an open cholecystectomy. Hence conventional methods of suture ligation should be performed in such cases whilst keeping in mind to ligate the cystic duct closer to the gallbladder which will prevent injury to the portal vein . Abdalla et al. state that knowledge of such common and rare variations of boundaries and contents of Calot’s triangle is crucial to prevent iatrogenic injuries . William S, Haubrich M D. Calot of the Triangle of Calot. Gastroenterology 2002;125:1440. Standring S, Gray H. Gray’s Anatomy. 40th ed. Spain:Churchill Livingstone. Elsevier 208;1179-80. Viste A, Horn A, Ovrebo K. Bile duct injuries following laproscopic cholecystectomy. Scand J Surg 2015;104:233-37. Renz BW, Bosch F, Angele MK. Bile Duct Injury after Cholecystectomy: Surgical Therapy. Visc Med 2017;33:184-90. Ahmad S, Khan N, Asmatullah. Anatomical variations of hepatobiliary triangle in patients operated laparoscopically for gallbladder diseases from Lahore and Sahiwal. Punjab Univ J Zool 2016;31:047-52. Johnston GW. Iatrogenic bile duct stricture: an avoidable surgical hazard? Br J Surg 1986;73:245-47. Nagral S. Anatomy relevant to cholecystectomy. J Minimal Access Surg 2005;1:53-8. Ding YM, Wang B, Wang WX, et al. New classification of the anatomic variations of cystic artery during laparoscopic cholecystectomy. World J Gastroenterol 2007;14:5629-34. 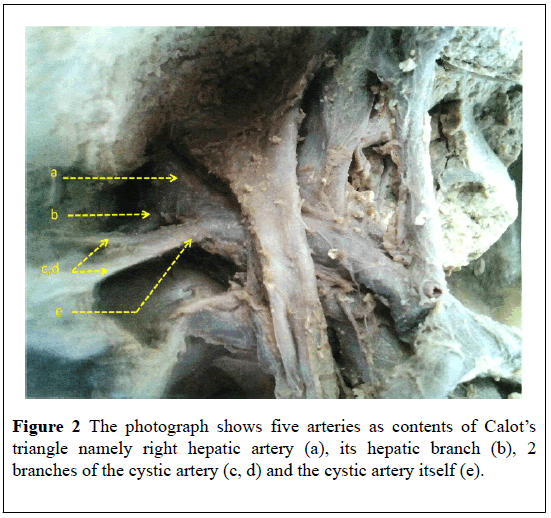 Ahmed M, Sylvia S. Origin of Cystic Artery and its Position in Relation to Biliary Ducts and Calot s Triangle. Journal of Evolution of Medical and Dental Sciences 2015;01:4:1-5. Andall RG, Matusz P, du Plessis M, et al. The clinical anatomy of cystic artery variations: a review of over 9800 cases. Surg Radiol Anat 2016;38:529-39. Chamberlain RS. Essential Functional Hepatic and Biliary. Anatomy for the Surgeon 2013. Aristotle S. Variations in origin and course of cystic artery and its relations to Calot’s triangle with its clinical implications. OA Anatomy 2014;18:17. Abeysuriya V, Kumarage S, Hasan R, et al. Morphological Variations of Cystic Artery in Triangle of Calot in Laparoscopic Cholecystectomy: Experience in Tertiary Care Surgical Unit in South Asian Country, Quest Journals Journal of Medical and Dental Science Research 2016;3:18-19. Dandekar U, Dandekar K. Cystic Artery: Morphological Study and Surgical Significance. Anatomy Research International 2016;6. Michels NA. The Hepatic, Cystic and Retroduodenal Arteries and Their Relations to the Biliary Ducts: With Samples of the Entire Celiacal Blood Supply. Annals of Surgery 1951;133:503-24. Suzuki M, Akaishi S, Rikiyama T, et al. Laparoscopic cholecystectomy, Calot’s triangle, and variations in cystic arterial supply, SurgEndosc 2000;14:141-4. Abdalla S, Pierre S, Ellis H. Calot'striangle. Clin Anat 2013;26:493-501.